Millions of users religiously jailbreak their devices in order to install minor tweaks that change the way specific aspects of the system looks or works, which is why the new LiveWire tweak is sure to be extremely popular with those looking for a free-of-charge animation based download. More details after the jump. LiveWire is simple, lightweight and does exactly what is says in the description; it hooks directly into the iOS lock screen to introduce a rather appealing little animation when the jailbroken device is unlocked. 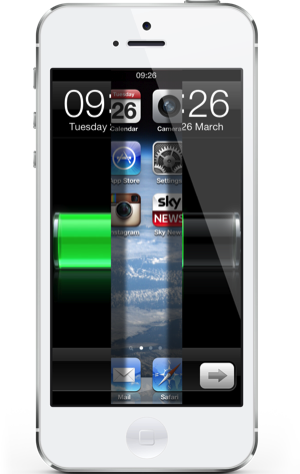 Rather than unlocking the iPhone or iPod touch and being immediately presented with the home screen underneath, LiveWire introduces a sliding panel effect that gives the impression that a door is being opened to show the underlying content. As you might expect, the package isn’t dependent on ay specific wallpaper or alternative lock screen package being installed on the device and there have been no reports of any conflicts with the major lock screen tweaks such as IntelliscreenX or LockInfo. There are no additional settings to configure after installation and everything should just be up and running as soon as the device is unlocked. We’ve seen plenty of tweaks in the past that hook directly into a jailbroken device’s lock screen to introduce different animations. Some of them work in the same fashion as LiveWire by introducing one static animation, such as Unfold by Jonas Gessner. Other offerings take things a little further by coming with a set of configurable options that allow different animations to be applied to the lock screen with varying characteristics such as animation time. LiveWire is available as a free-of-charge download from the BigBoss repository and is currently compatible with jailbroken iPhones and iPod touches running iOS 5.1 all the way up to 6.1.2.